Eighty (80) HearUSA size 10 hearing aid batteries. Replaces all size 10 (yellow) hearing aid batteries. 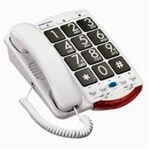 Big button phone increases incoming sounds up to 37 decibels and electronic voice repeats dialed numbers. With 37-dB amplification, braille characters and talk. The JV35™ amplified phone, by Clarity®, features Clarity® Power™ technology to make words not only louder, but also clearer and easier to understand. With large high-contrast buttons and up to 37 decibels of amplification, the JV35™ is an ideal solution for those with a moderate hearing loss or low vision. Discover a world of helpful aids for the hearing impaired! It's not just about batteries for hearing aids! Yes! This is the place with the best discounts on hearing aid batteries and those hard to find assistive hearing devices for the deaf AND ANYONE with any degree of hearing deficiency! While you are visiting, be sure to check out our Deal of the Day (see the Hearing Shop menu of products) for sales on some of the best assistive listening devices in the hearing health industry. You'll find more featured items for the hearing impaired community like personal audio enhancers, phone amplifiers for the hard of hearing, children's hearing aid accessories and more. Happy browsing! Technological solutions for severe hearing deficiancies and deaf telecommunication include TTY (text telephone) and VCO (voice carry over). These assistive hearing devices are similar in that they both use a text display allowing a hard of hearing person to use a telephone by reading typed messages. In both of these special hearing devices, the hard of hearing user requires the other person's responses to be typed to read, either by the person himself or by a special operator through a Telecommunication Relay Service (TRS).